Not much time for blogging, but this is ‘book of the day’ – it just arrived in the mail. Maybe you should buy it as well – do it here (ebook) or here (paperback). Anybody who have been following my blog knows how much admiration I have for George Selgin so when George speaks I listen and if he says I am wrong I would not easily dismiss it without very careful consideration. Now George has written a challenge on Freebanking.org for us Market Monetarists. In his post “A Question for the Market Monetarists” George raises a number of issues that deserves answers. Here is my attempt to answer George’s question(s). But before you start reading I will warn you – as it is normally the case I think George is right at least to some extent. While it is correct that Market Monetarists – and I am one of them – have been calling for monetary easing both in the US and the euro zone this to me is not because I want to “boost employment”. I know that other Market Monetarists – particularly Scott Sumner – is more outspoken on the need for the Federal Reserve to fulfill it’s “dual mandate” and thereby boost employment (Udpate: Evan Soltas has a similar view – see comment section). I on my part have always said that I find the Fed’s dual mandate completely misguided. Employment is not a nominal variable so it makes no sense for a central bank to target employment or any other real variable. I am in favour of monetary easing in the euro zone and the US because I want the Fed and the ECB to undo the mistakes made in the past. I am not in favour of monetary policy letting bygones-be-bygones. I do, however, realise that the kind of monetary easing I am advocating likely would reduce unemployment significantly in both the euro zone and the US. That would certainly be positive, but it is not my motive for favouring monetary easing in the present situation. See here for a discussion of Fed’s mandate and NGDP targeting. This is the Free Banking advocate George Selgin speaking. The Free Banking advocate Lars Christensen does not disagree with George’s fundamental free banking position. However, George also knows that in the event of a sharp rise in money demand in a free banking regime the money supply will expanded automatically to meet that increase in money demand (I learned that from George). In 2007-9 we saw a sharp rise in dollar demand and the problem was not that the Fed did too much to meet that demand, but rather that it failed to meet the increase in money demand. Something George so well has described in for example his recent paper on the failed US primary dealer system. See here. However, I certainly agree with George’s position that had monetary policy been conducted in another more rational way – for example within a well-defined NGDP targeting regime and a proper lender-of-last-resort regime – then the Fed would likely have had to expand it’s money base much less than has been the case. Here I think that we Market Monetarists should listen to George’s concerns. Sometimes some of us are to eager to call for what could sound like a discretionary expansion of the money base. This is not really the Market Monetarist position. The Market Monetarist position – at least as I think of it – is that the Fed and the ECB should “emulate” a free banking outcome and ensure that any increase in money demand is met by an increase in the money base. This should obviously be based on a rule based set-up rather than on discretionary monetary policy changes. Both the Fed and the ECB have been insanely discretionary in the past four years. This is a tricky point on which the main Market Monetarist bloggers do not necessarily agree. Scott Sumner and Marcus Nunes have both strongly argued against the “Hayekian position” and claim that US monetary policy was not too easy prior to 2008. David Beckworth prior to the crisis clearly was arguing that US monetary policy was too easy. My own position is somewhere in between. I certainly think that monetary policy was too easy in certain countries prior to the crisis. I for example have argued that continuously in my day-job back in 2006-7 where I warned that monetary conditions in for example Iceland, the Baltic States and in South Eastern European were overly loose. I am, however, less convinced that US monetary policy was too easy – for the US economy, but maybe for other economies in the world (this is basically what Beckworth is talking about when he prior to crisis introduced the concept the Fed as a “monetary superpower”). However, it would be completely wrong to argue that the entire drop in NGDP in the US and the euro zone is a result of a bubble bursting. In fact if there was any “overshot” on pre-crisis NGDP or any “bubbles” (whatever that is) then they certainly long ago have been deflated. I am certain that George agrees on that. Therefore the possibility that there might or might have been a “bubble” is no argument for maintain the present tight monetary conditions in the euro zone and the US. That said, as time goes by it makes less and less sense to talk about returning to a pre-crisis trend level for NGDP both in the US and the euro zone. But let’s address the issue in slightly different fashion. Let’s say we are where presented with two different scenarios. In scenario 1 the Fed and the ECB would bring back NGDP to the pre-crisis trend level, but then thereafter forget about NGDP level targeting and just continue their present misguided policies. In scenario 2 both the Fed and the ECB announce that they in the future will implement NGDP level targeting with the use of NGDP futures (as suggested by Scott), but would initiate the new policy from the present NGDP level. I would have no doubt that I would prefer the second scenario. I can of course not speak from my Market Monetarist co-conspiritors, but to me the it is extremely important that we return to a rule based monetary policy. The actual level of NGDP in regard is less important. This is an empirical question and I am not in a position to give an concrete answer to that. However, would argue that most of the increase in unemployment and the lack of a recovery in the labour market both in the US and the euro zone certainly is due to a lack of spending and therefore monetary easing would likely significantly reduce unemployment in both the US and the euro zone. Finally I don’t really think that George challenge to the Market Monetarists is question about wage-expectations. Rather I think George wants us to succeed in our endeavor to get the ECB and the Fed to target NGDP. While George does not spell it out directly I think he share the concern that I from time to time has voiced that we should be careful that we do not sound like vulgar Keynesians screaming for “monetary stimulus”. To many the call for QE3 from the sounds exactly like that and for exact that reason I have cautious in calling for another badly executed QE from the Fed. Yes, we certainly need to call for monetary easing, but no one should be in doubt that we want it within a proper ruled based regime. 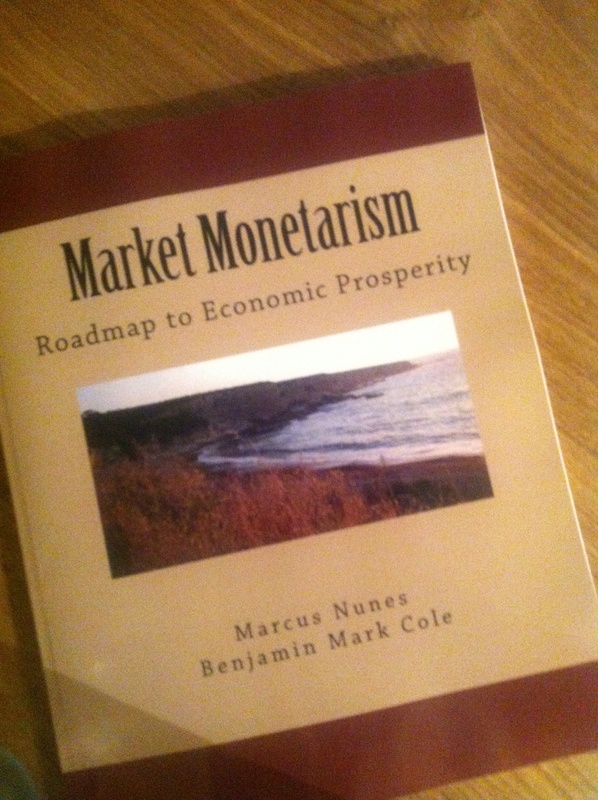 “I believe that much of the confusing about our position on monetary policy has to do with the kind of policy advise that Market Monetarist are giving in the present situation in both the US and the euro zone. Both the euro zone and the US economy is at the presently in a deep recession with both RGDP and NGDP well below the pre-crisis trend levels. Market Monetarists have argued – in my view forcefully – that the reason for the Great Recession is that monetary authorities both in the US and the euro zone have allowed a passive tightening of monetary policy (See Scott Sumner’s excellent paper on the causes of the Great Recession here) – said in another way money demand growth has been allowed to strongly outpaced money supply growth. We are in a monetary disequilibrium. This is a direct result of a monetary policy mistakes and what we argue is that the monetary authorities should undo these mistakes. Nothing more, nothing less. To undo these mistakes the money supply and/or velocity need to be increased. We argue that that would happen more or less “automatically”…if the central bank would implement a strict NGDP level target. I hope that that is an answer to George’s more fundamental challenge to us Market Monetarists. We are not keynesians and we are strongly against discretionary monetary policy and I want to thank George for telling us to be more clear about that. Finally I should stress that I do not speak on behalf of Scott, Marcus, Nick, 2 times David, Josh and Bill (and all the other Market Monetarists out there) and I am pretty sure that the rest of the gang will join in with answers to George. After all most of us are Selginians. Update 2: Scott also has a comment on George’s posts. I think this is highly productive. We are moving forward in our understanding of not only the theoretical foundation for Market Monetarism, but also in the understanding of the economic situation. Udpate 3: Also comments from David Glasner, Marcus Nunes and Bill Woolsey. 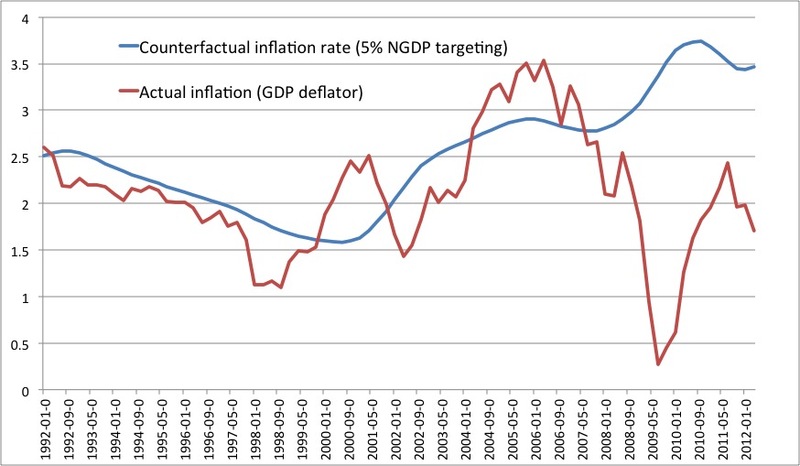 Yesterday, I did a (very short) post about Irish deflation and there is no doubt that the euro crisis continues. Depressingly there is no really appetite among ECB policy maker to fundamentally have a change of monetary policy to change the status quo and while there is a (misguided) debate going on about fiscal austerity in Europe there is still no real debate about the monetary policy set-up in Europe. On the other hand in the US we are having a real debate among academics, commentators and central bankers about US monetary policy. In the US fed economists like Robert Hetzel are allowed to publish book about how monetary policy mistakes cause the Great Recession. In Europe there is no debate. That is very unfortunate. The contrast between Europe and the US would be very clear by listen to what Chicago Fed’s Charles Evans have to say about US monetary policy. Take a look at this debate in which Evans endorse NGDP level targeting! Could you imagine that a member of the ECB Executive Board did that? Wouldn’t that just be a nice change from the business-as-usual climate we have now? See also this excellent article from pro-market monetarist commentator Matt O’Brien at The Atlantic on Charles Evans’ endorsement of NGDP level targeting. Our friend Marcus Nunes also has an update on Charles Evans pro-NGDP targeting position. See Scott Sumner on the same topic here.